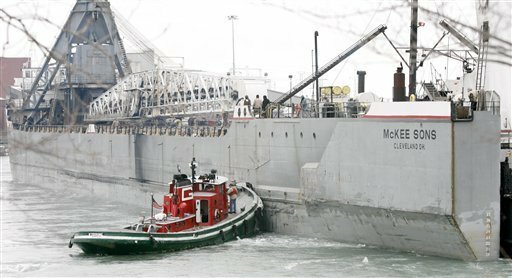 The 579-foot (self unloading barge) McKee Sons went aground on the Detroit River near Grosse Ile, Michigan on December 24, 2010. The vessel was completing a trip from Cleveland to the DTE Energy power station with a cargo of 11,900 tons of coal when it went hard aground. The McKee Sons stayed aground December 25 with efforts to free her the next day. With the help of 7 tugs, the vessel was freed and continued to the dock. Reports state no pollution or structural damage to the vessel.